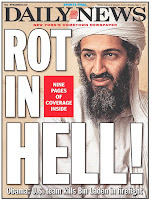 On Sunday, May 8th, Iranian Intelligence Minister Heidar Moslehi claimed the Iranian government has evidence that al-Qaeda leader Osama bin Laden died of illness and not during a U.S. raid earlier this month. "We have accurate information that bin Laden died of illness some time ago," Moslehi said on the sidelines of an Iranian cabinet meeting on Sunday, as quoted by FARS News Agency. "If the US military and intelligence apparatus have really arrested or killed bin Laden, why don't they show him (his dead body) why have they thrown his corpse into the sea?" Moslehi asked according to a press report, FARS news agency reports. Moslehi is also quoted as saying U.S. officials resort to such PR campaigns to divert attention from domestic problems as well as their "fragile" economic situation, FARS reports.